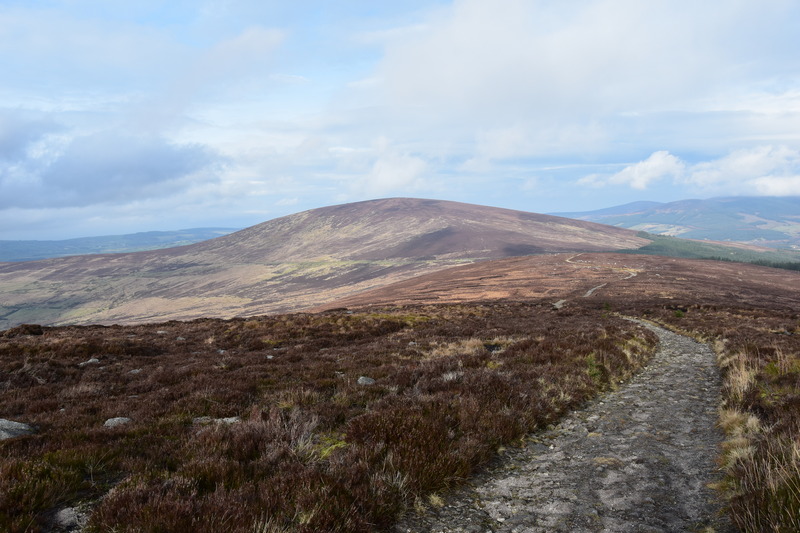 Before joining my friend Daniel to attend our first ever MountainViews meeting in Dublin, I headed to the Wicklow hills for a short hike under the only real bit of sunshine I will get during the whole stay !! 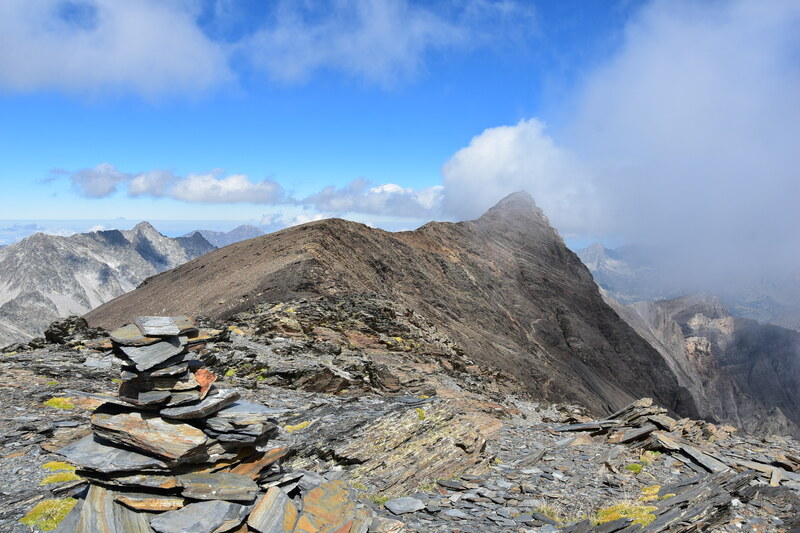 A two-day trip with a night in a bothy, to take Iplay4you and his camerawoman to the summit of the Pic de Cagire (1912m). 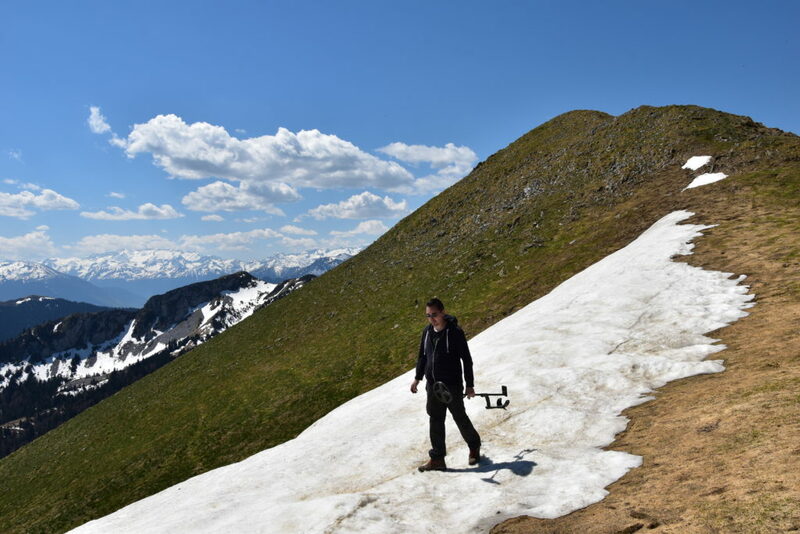 Iplay4you is a famous French Youtuber whose channel “Chasseurs de Trésor” talks about metal detection, and he carried both his detector and spade to the top of the peak and along part of the ridge, where we could enjoy the breathtaking vista over the higher, snow-topped ridges. A very special moment, recorded in a video (in French) !! Back in Ireland at last, I could not resist a quick evening walk up Mullaghcarn (542m) and its S Top (526m). On the way up, I was blessed with an amazing sunset in a hazy atmosphere. 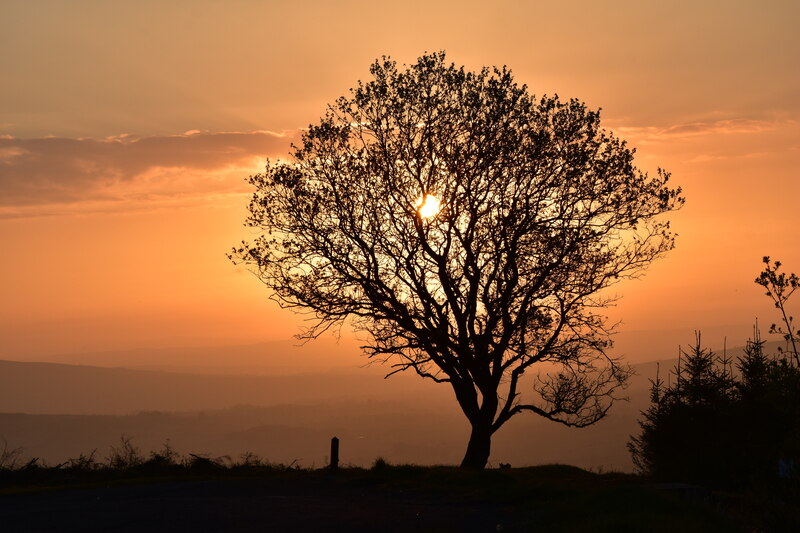 After storming the Sperrin Mountains and as a test before my first ever Challenge Walk, due to take place a week later, I met my friend Daniel for my first big hike of the year: the Moyle Way. 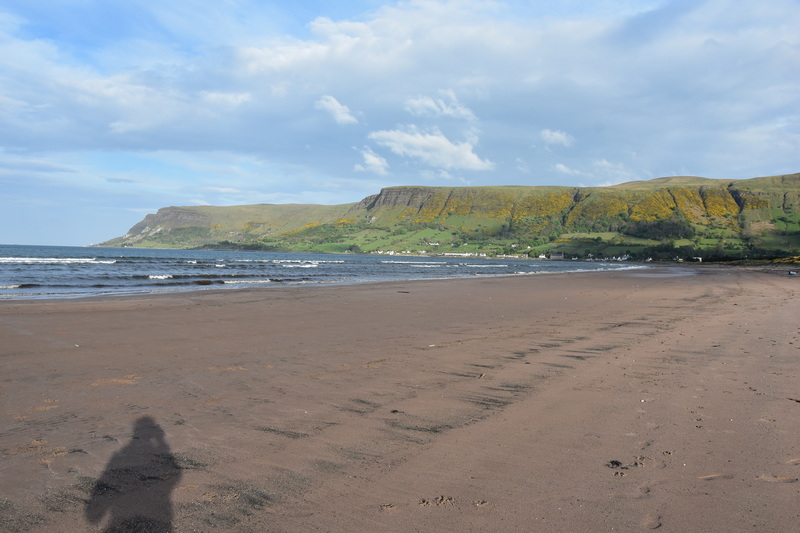 This 45.7km trail -including a short detour to Trostan (550m)- with over 1100m total height gain led us through grassy fields, moorland and forests from Ballycastle to Waterfoot, where we took a few minutes to wander euphorically on the beach. I had climbed Muckish (667m) back in November 2012, with great difficulty due to my lack of condition at the time. Being back up to this iconic summit -this time with the views and via the rather exposed Miner’s Track- was a very emotional moment for me. 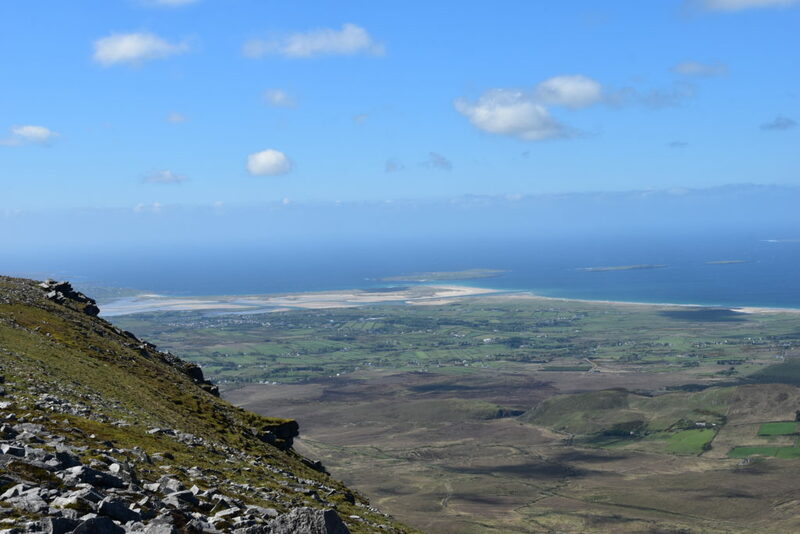 The vista from the summit plateau over the N Donegal Atlantic coastline and the rest of the Derryveagh Mountains is absolutely breathtaking. 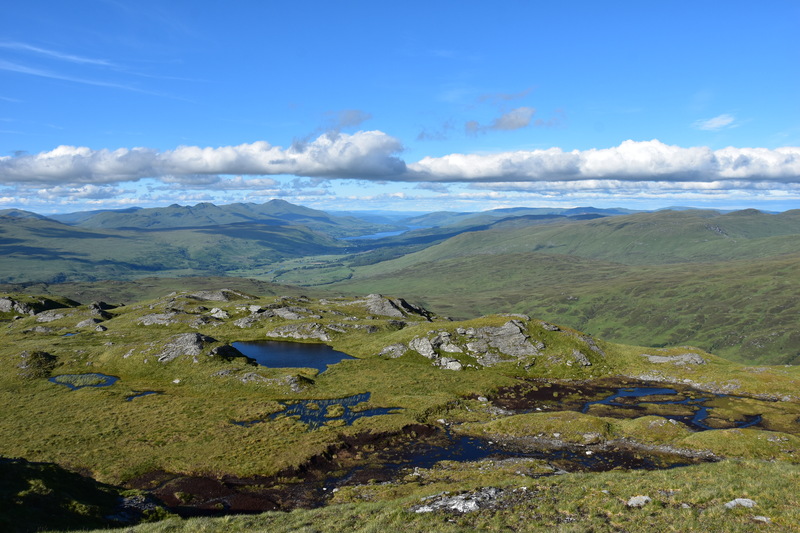 On the way to the S, I stopped for two nights at The Benwiskin Centre Hostel in Ballaghnatrillick and was lucky enough to enjoy some nice weather for my walk up Truskmore (647m) and Tievebaun (611m). 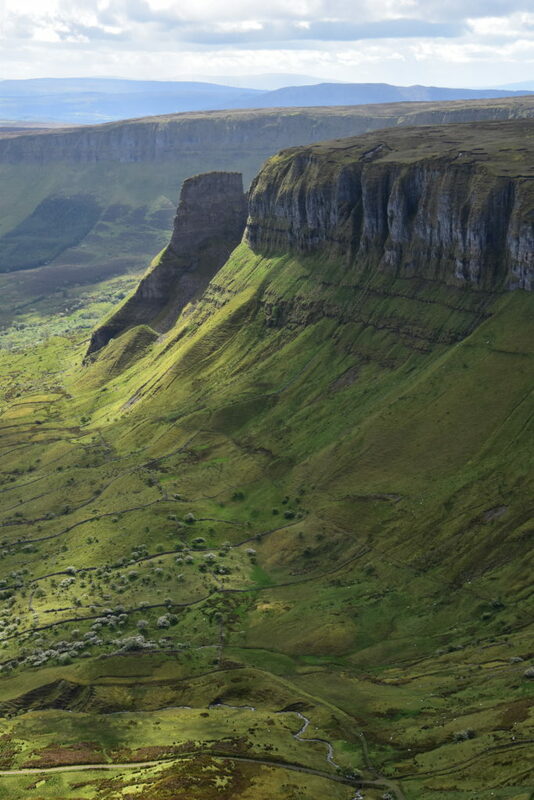 Here, between counties Sligo and Leitrim, just a few kms from the Atlantic Ocean, rise an amazing series of plateaus encircled with steep cliffs. The sunlight peering through the clouds over the green slopes added to the magic of the scenery. My first Challenge Walk, brilliantly organised by The Wayfarers Hiking Club yearly, saw me climb more in a day than I ever had before (1630m). But most of all, it enabled me to meet other keen walkers, and also to discover the beautiful Blackstairs Mountains while adding a few more summits to my total. After a big walk up Camaderry (698m) and Tonelagee (812m) and back along the Brockagh ridge the previous day, I decided to climb the legendary summit of Lugnaquilla (926m), highpoint of the Wicklow Mountains and one of the highest in Ireland, on the last day of my stay. Tired after two weeks of intense hill-walking, I ended the walk knackered but with an immense feeling of self-accomplishment. For my very first hike in the Lakes, I had the great pleasure to meet two fellow members of the#Walk1000miles FB group, Jay and Helen. 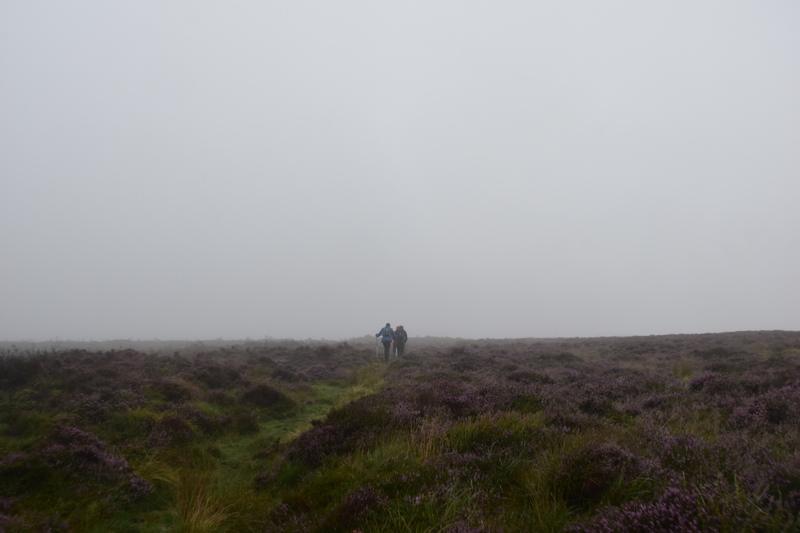 We had a beautiful walk around the Kentmere Horseshoe, taking in 9 wainwrights on the way. For my second hike in the Lakes, I met an English outdoor blogger, Mark Barrett, aka. Hill Explorer. He took me on an amazing adventure around the Langdale Pikes (taking in 8 wainwrights). 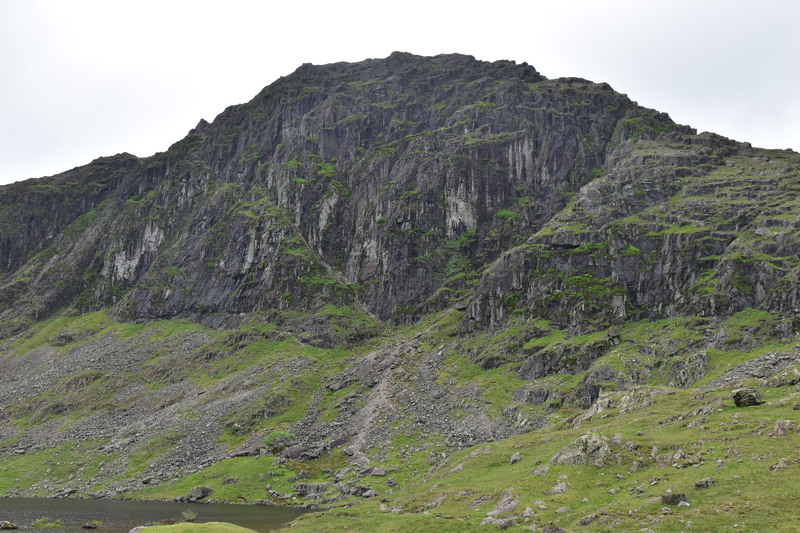 The route included the scary scramble up Jack’s Rake (the diagonal to the centre-left on the pic), a first-time experience for me as I had never done such a long scramble before. One of the most incredible things I have done in 2017 is arguably deciding in the last minute to climb the iconic Buachaille Etive Mor by night, starting at around 2.00am and without getting a single minute of sleep. 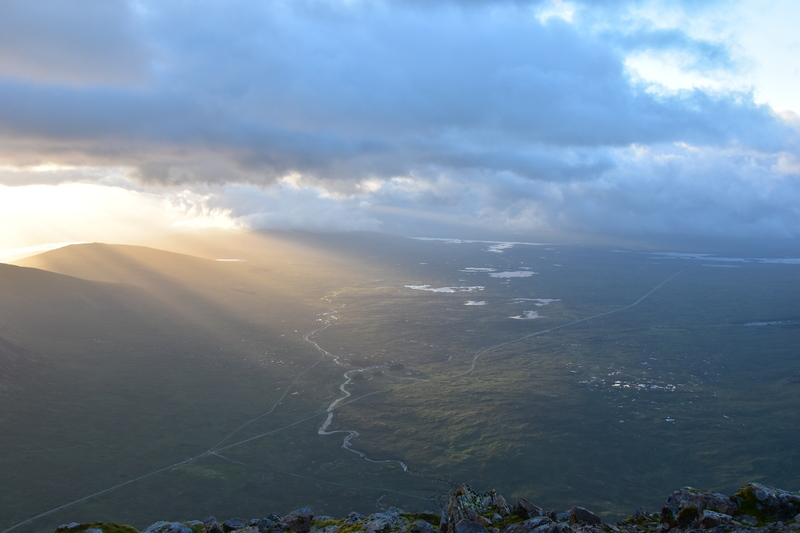 I reached the summit of Stob Dearg (highpoint of the ridge at 1021m) right on time to watch the sun rise over the Rannoch Moor and Glencoe. Unforgettable !! More about this amazing walk in my blog article (see “Scotland” file). Hardly had I set foot on Skye that I decided to head for Marsco (736m). 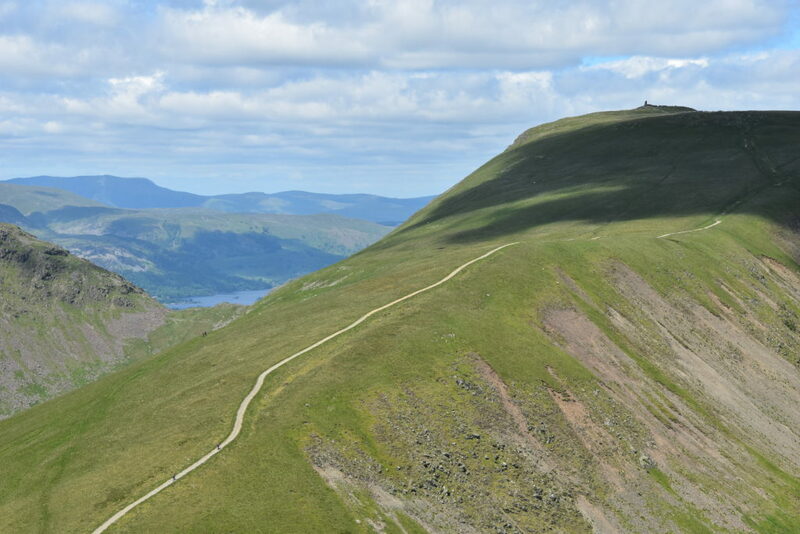 Despite the glorious sunshine, I nearly had to give up below the summit ridge due to the gusty winds. I finally found a sheltered route and made it to the top of the ridge, where surprisingly the wind was less strong. 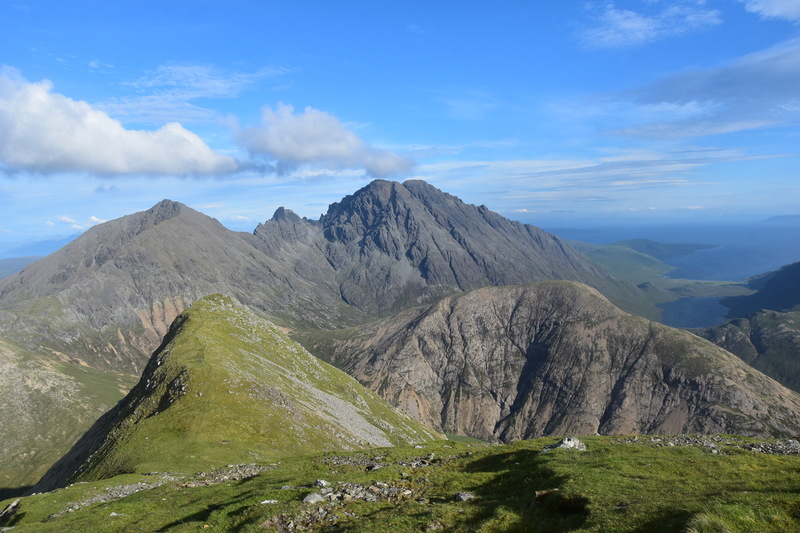 Nevertheless, due care was required along the narrow part of the ridge near the top, where the views over the Black and Red Cuillins and over both sides of the island’s Atlantic coastline are absolutely breathtaking. As a preparation for the Fei Sheehy Challenge the next August, which requires 3 tough days walking in-a-row, I had challenged myself to complete three big, consecutive walks before leaving Scotland. After climbing Ben Lomond (974m) under the clouds the previous day, I headed for a longer, tougher one up two other munros, Ben More (1174m) and Stob Binnein (1165m), plus several minor tops. Despite the two main tops only uncovering just after I had climbed them, I had a brilliant day out with stunning views !! Back to the Pyrenees with my best friend Alexandre, for a two-day trip to climb the Pic de Crabère (2630m). We reached this amazing top which stands at the Spanish border on the second day, and the 360° vista was absolutely breathtaking. 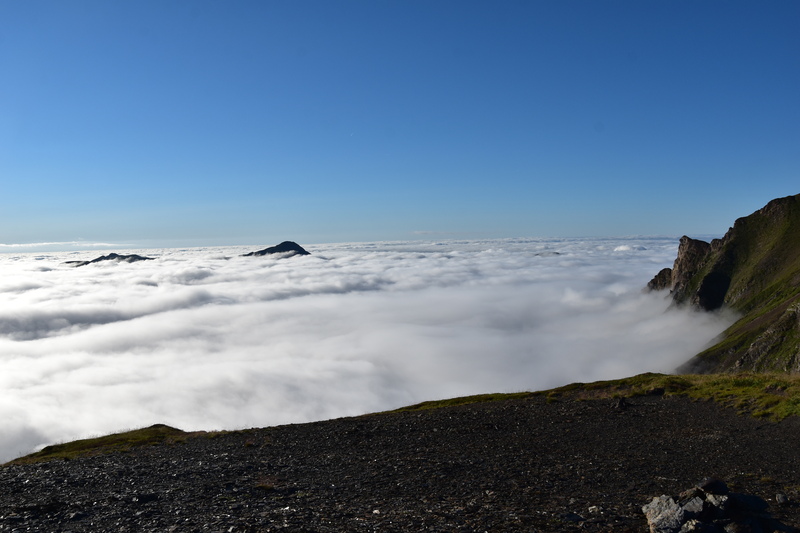 But on the previous day, we had this (see pic) as we reached the Col de la Serre d’Araing (2220m): a fantastic cloud inversion on each side of the ridge, which left us speechless !! 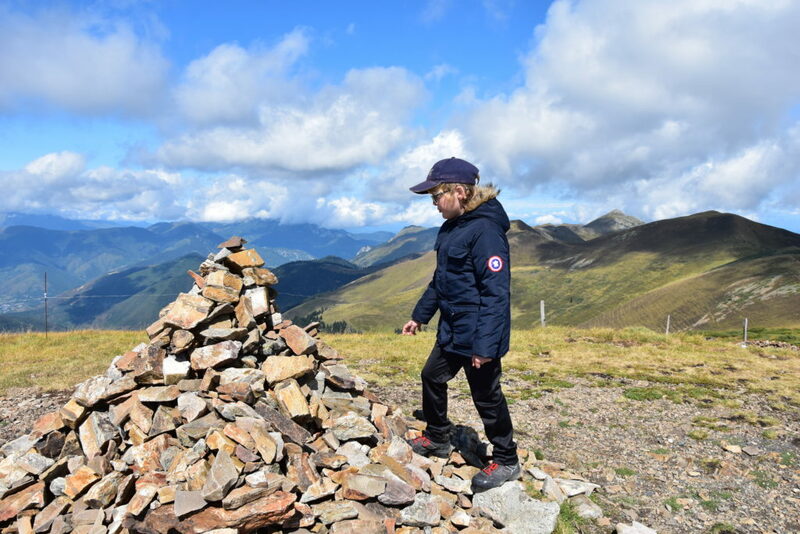 For my first substantial hike in the Alps, I took my 9-year-old son to the top of the Mont Barral (1903m). 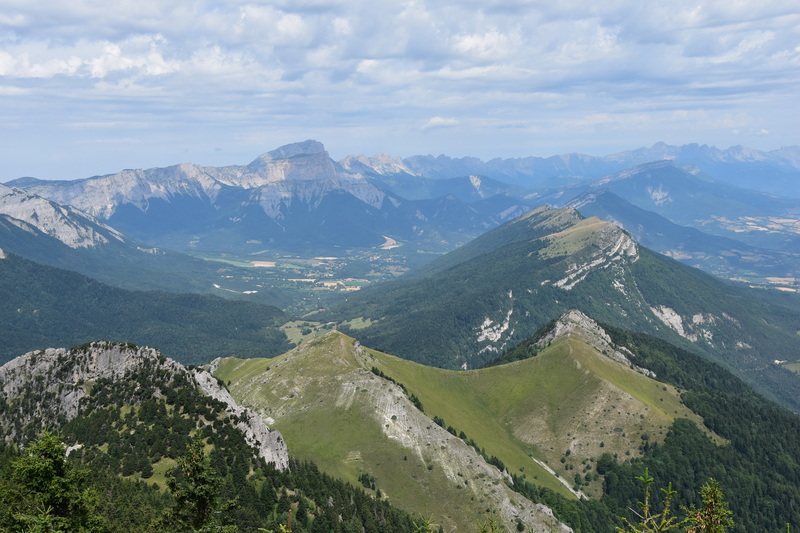 I felt very proud of him and we sat gazing at the stunning vista, especially to the N, where kilometers of vertical cliffs drop from the Vercors massif. A 3-days/2-nights’ bivvy with Alexandre and his kids (11 and 12), to climb the Turon de Néouvielle (3035m). Tough one for the kids, who both proudly made it to the top nevertheless, constantly encouraged and supervised by Alexandre and I. Our respective experience was a must on this big hike, so as to make it both safe and enjoyable for all. A long but safe route to a mighty top. I had already climbed the Pic du Canigou (2784m), the sacred mountain of Catalonia, three years ago with Alexandre and his daughter (who was aged 8 at the time), but that was from the Refuge des Cortalets; so I decided to make it tough this time. 25km, over 1800m total ascent in about 10 hours, and still the same stunning views !! The big day has arrived: 38km with 1500m ascent await. Another big test which I will pass successfully, along with some 40 other participants, a lovely bunch of people, some of whom will become friends. 30km, 1620m total ascent, this second day needed to be taken easy after the tough previous one. About halfway, I stopped for a snack with Daniel, Mike, Steven and Jim, with which I decided to hang around for the rest of this fine day out, during which we crossed one of Ireland’s highest summits, Galtymore (918m). The pic shows the last summit of the day, Temple Hill (783m). One of the best moments of the day was the arrival, with some hot drinks and home-made cakes awaiting !! A crap day out weather-wise leading me to what could be a personal best. No-one likes to spend too much time in the rain, so I just push myself to follow these three for a while, before they start running. 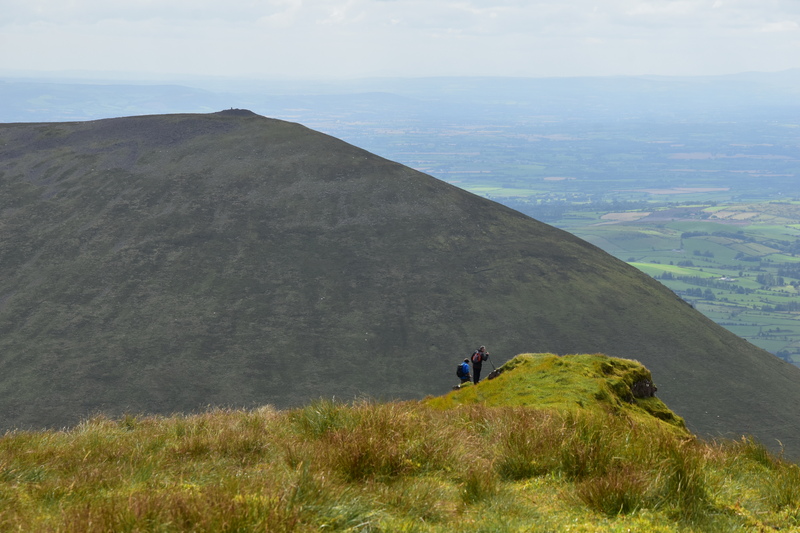 About an hour later, as I reach the summit of Knockmealdown (794m), I am joined by Kevin. “Man, I must have been fast”, do I think to myself, but then no chance I can follow him as he flies in the descent to the Vee. Just before I reach the col, I meet Gerard Sheehy, the organiser of the challenge. “You’ve been flying”, he says, “and your navigation has been perfect !!”. I show him the GPS and tell him I am cheating to get “home” as soon as possible for the hot coffee, sandwiches and cakes. He gives me a few precious explanations to climb and follow the rest of the ridge. Careful navigation takes me to Ballyporeen in 6h23. I have completed the Fei Sheehy Challenge !! Each finisher is warmfully congratulated and cheered, then offered hot drinks and nice food. Gerard makes sure everyone is back safe. Each participant then receives a certificate and a medal. We all get a bit emotional when comes the time when we must leave. An incredible challenge organised by an admirable and devoted crew, three amazing days out in stunning landscapes, lovely, highly motivated participants, and amongst them some new, like-minded friends: Ulla, Marzena, Mark, Mike, Steven, Jim, Andy, Gerry, David, Alan and Kevin to add to the ones I had met earlier this year, Ronan, Joe and Gerard, plus of course my great friend Daniel !! One last big walk in Ireland before flying back to France, a loop walk across the Comeragh Mountains, to take in the summits that were not on the Challenge route five days ago. 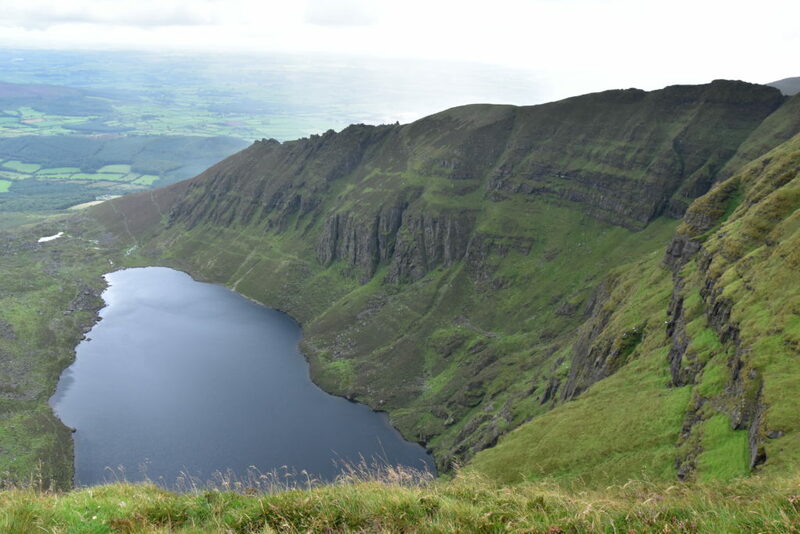 But the most spectacular part of the walk lies to the edges of the plateau, with several coums, the most impressive being this one, Coumshingaun. Another great day out with my 9-year-old son to reach the Mont Né (2147m) from the Port (col) de Balès (1755m). I usually do not share photos of him, but will make an exception for this one, which shows him about to touch the summit cairn. He was very proud as this was his first +2000m summit !! 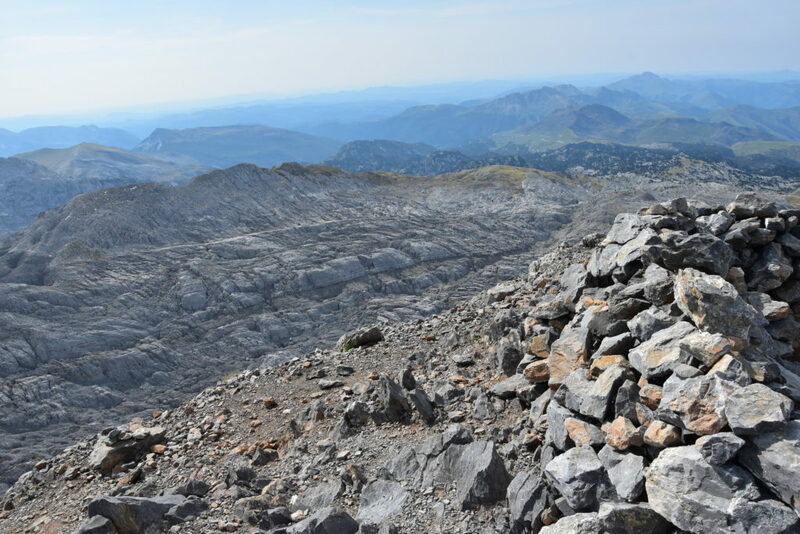 Another one I had climbed 3 years ago and my highest peak so far. 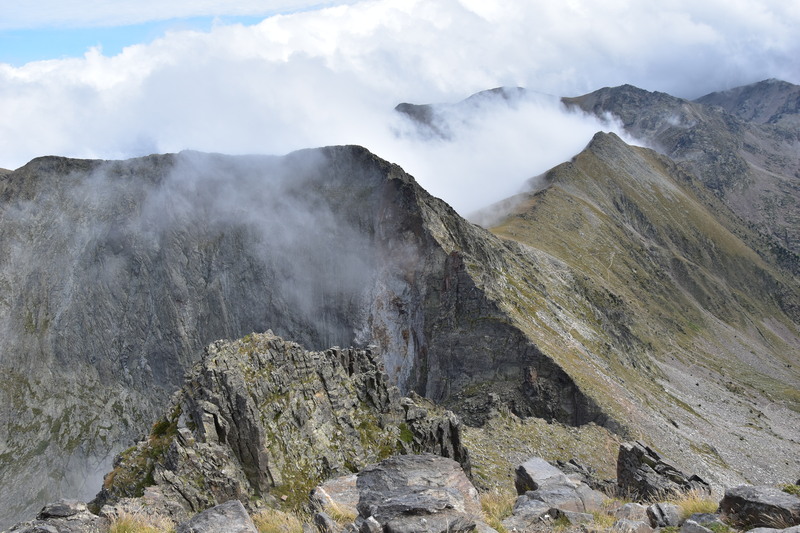 At 3173m, it is the second highest in the Néouvielle massif, still one of the most accessible. Needless to say the 360° vista is absolutely breathtaking !! 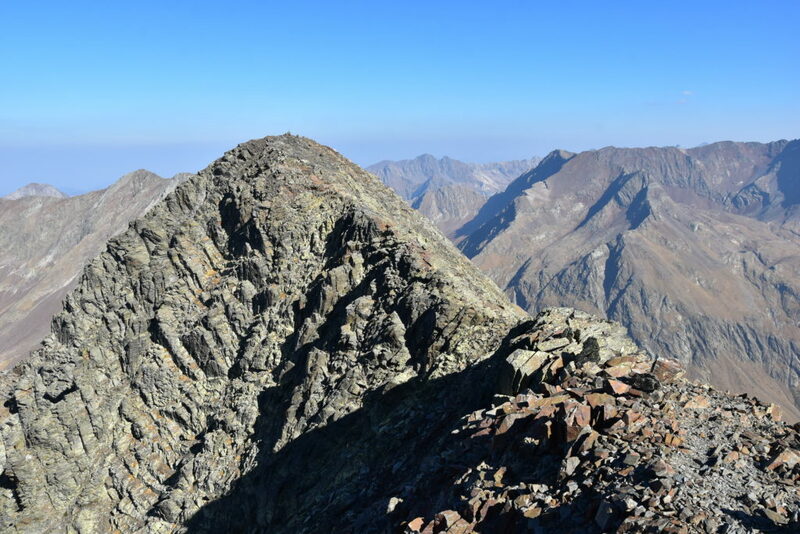 The pic shows the main summit from its SW Top, or Pic Lentilla (3157m). 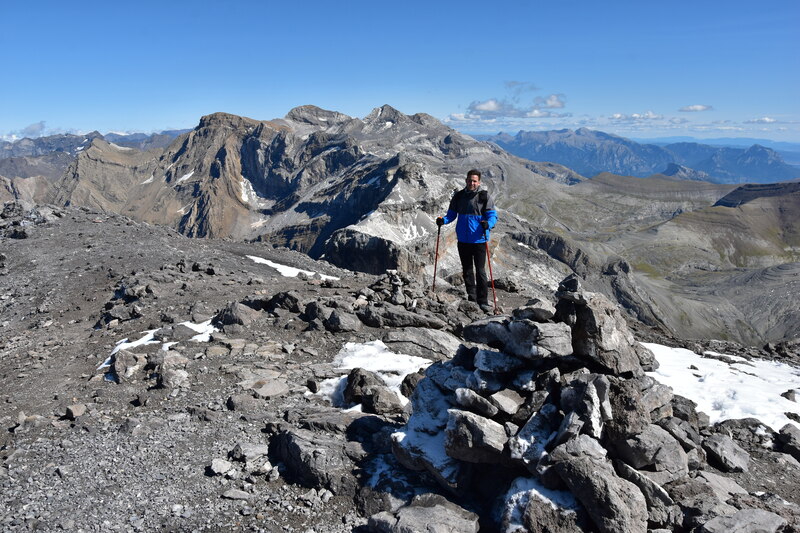 Another major highlight and probably the most spectacular hike of this year, completed with another new friend, David, photographed here as he reaches the summit of Le Taillon (3144m), with the Cirque de Gavarnie and Monte Perdido massif behind. The plan was to reach the famous Brèche de Roland (2807m), but we finally decided to continue towards Le Taillon, his first +3000m !! The locals call it “Jean-Pierre”. 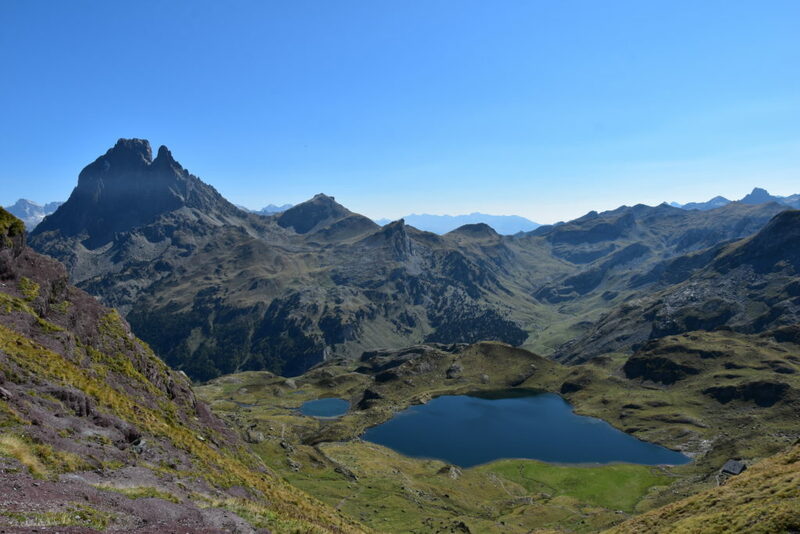 It was almost a year since I had climbed the Pic du Midi d’Ossau (2884m) -the most difficult climb I have done so far, with some grade II scrambling which was slightly too technical for me- so it was really nice to be back in the area. 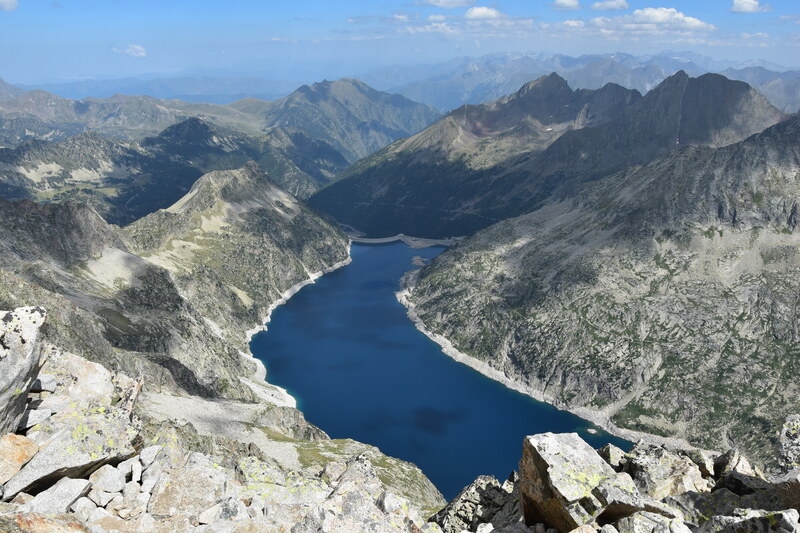 No scrambling on that day, but a lovely loop walk around the Lacs d’Ayous, with an additional out-and-back trip to the Pic d’Ayous (2288m). The glorious weather made for pure delight all along the way !! The big thrill !! After two weeks off, the mountains called me back. I chose the brightest day to do a last, mighty climb up the three Pics de Batoua (aka. 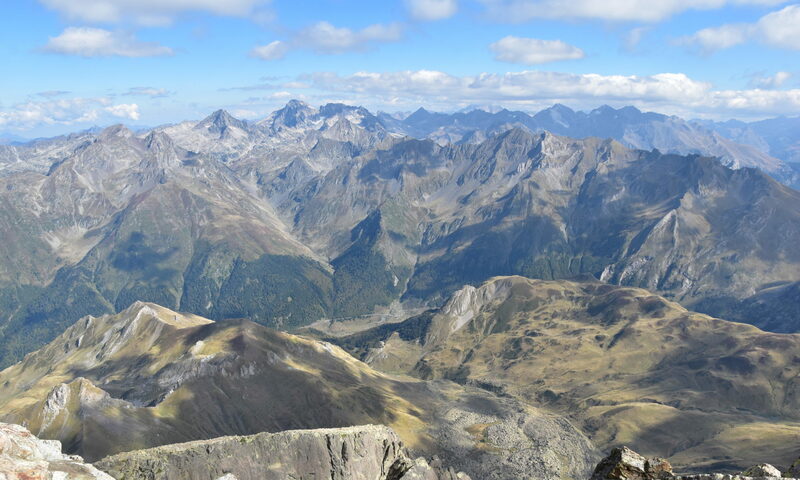 Culfreda, 3034, 3028 and 3032m), via the Pic de Cauarère (2901m). This remains as the best hike of the year in terms of sensations, and when I close my eyes I can still see myself scrambling along this exposed ridge and over the three tops, with some of the best 360° vista I have ever seen all around me (this being due to the fact that the main peak is the 10th most prominent peak of the Pyrenees). 18km, 1670m total ascent, 10h00 and an immense feeling of isolation. Absolutely breathtaking !! 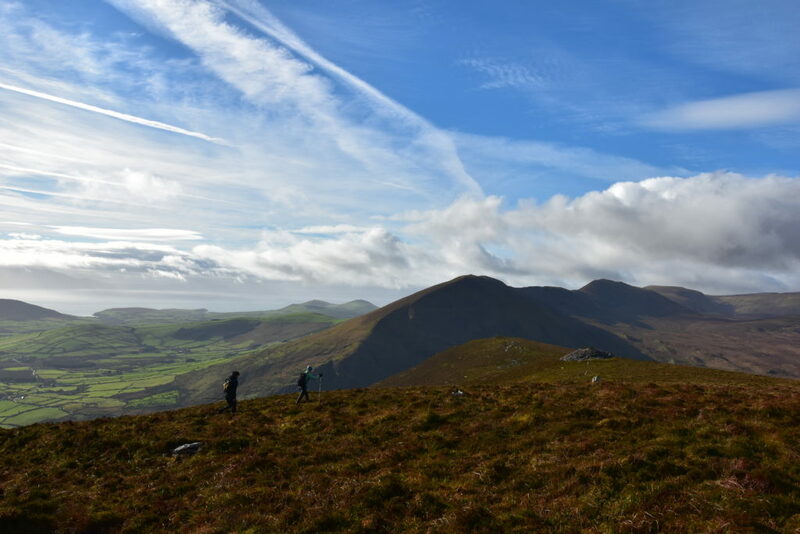 First big hike of my November trip on the Dingle Peninsula, a beautiful linear walk over two ridges, completed with Gerard and Maeve, another participant to the Fei Sheehy Challenge who lives in the area and proved to be a perfect guide. 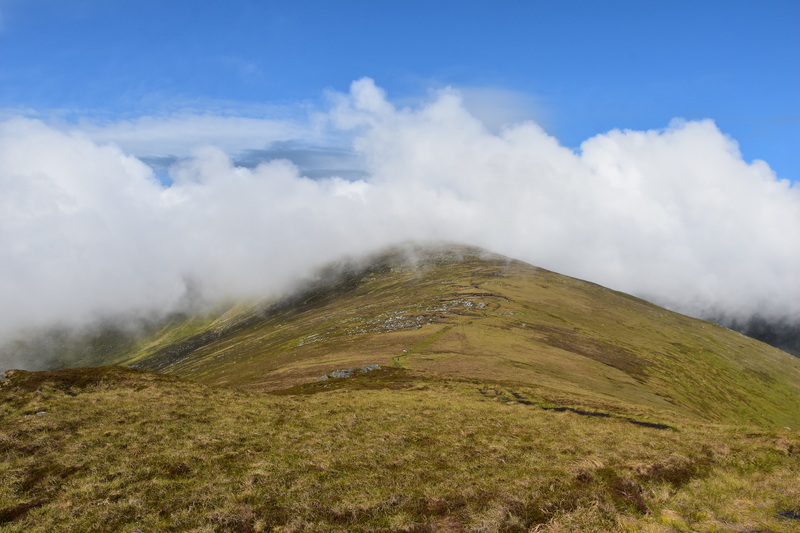 After a dull start, the weather turned rainy and windy as we reached the highest summits of the route, Beenoskee (826m) and Stradbally Mountain (798m), but then the skies opened and we were blessed with glorious sunshine for almost the whole rest of the day, allowing for mighty views. 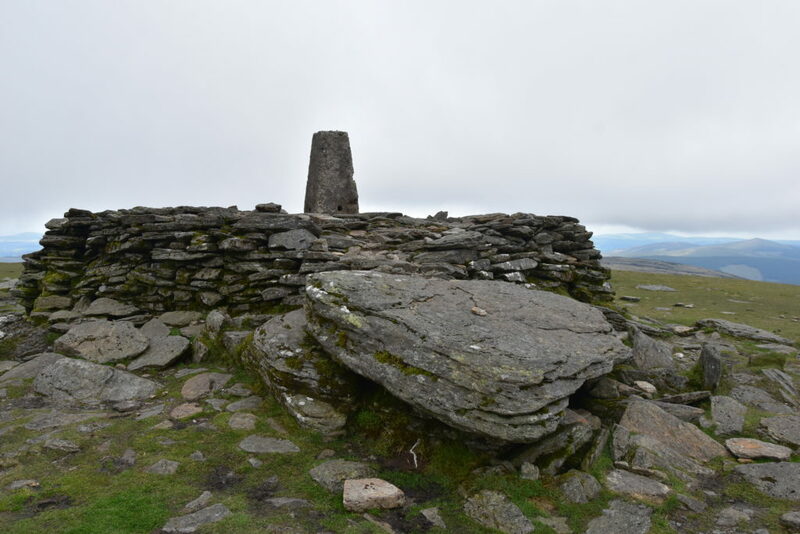 As we reached the high ground on the Dromavally ridge, Maeve took us to make a small detour to a huge cairn -actually a passage tomb- known locally as Cuchulainn’s Seat (see pic). Another mighty walk, up the Dingle giant, Mount Brandon (952m, second highest massif in Ireland), starting at sea level from Brandon village (centre of the pic). 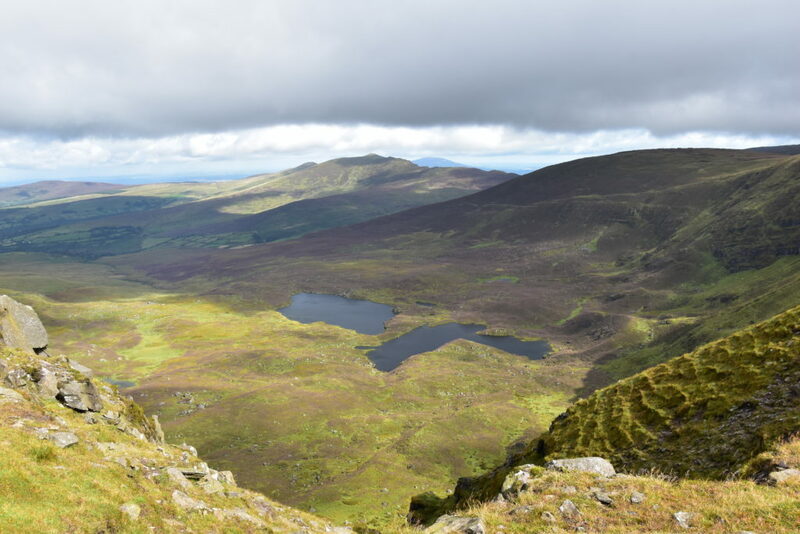 An out-and-back trip along the N ridge which offers what can arguably be considered as the best vista on the Emerald Isle. The photo shows the impressive Faha Ridge, with Brandon Bay in the distance, as seen from the summit. 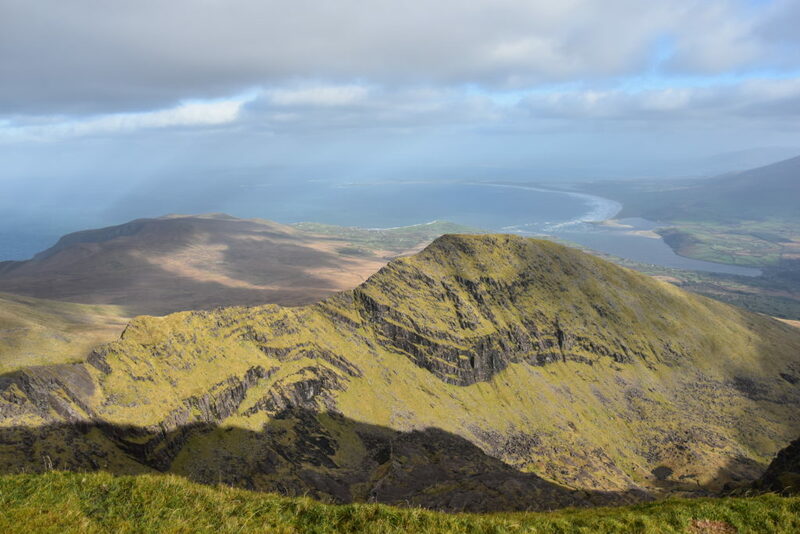 The next day, I climbed Mount Brandon again, this time via its S ridge and under the clouds. Information in articles or shared GPS tracks may not be accurate for example as regards safety or access permission. 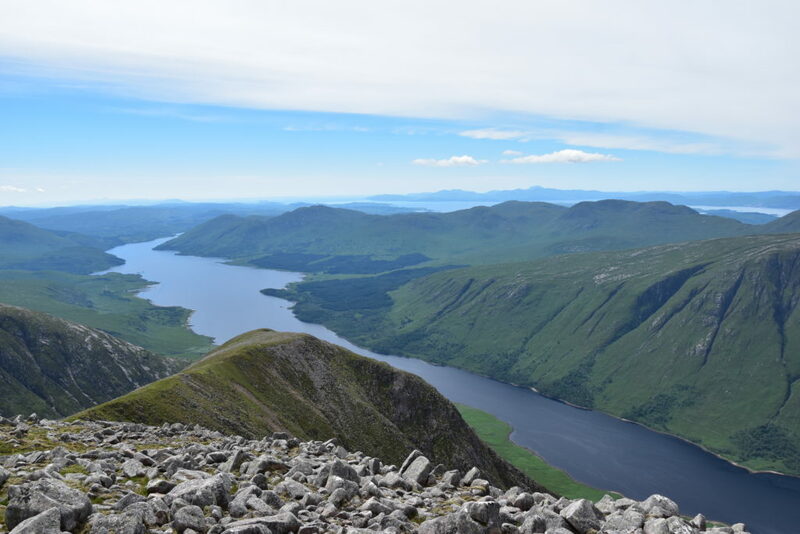 Hillwalking is a risk sport, which requires, amongst others, to be reasonably fit, adequately equipped to face challenging terrain and changing weather, and to be able to get orientated with a map and compass. You are responsible for your own / your group's safety. The author of this blog denies any responsibility regarding incidents or accidents which may ensue from the use of the proposed data.